Its initial effect on the life of the community came in 1848 when land was purchased from various landowners for the construction of the Farnham to Guildford branch of the London and South Western Railway Company (LSWR). The landowners included Lannoy Arthur Coussmaker of Westwood and the Mangles family who were Lords of the Manor of Wanborough. One of the members of this family was Captain Charles Edward Mangles, Chairman of the LSWR from 1859 until 1872. Certain inhabitants had to be compensated for the extinction of their Commoners' Rights to land that was taken for the railway. A meeting was held at a local hostelry to settle this claim. 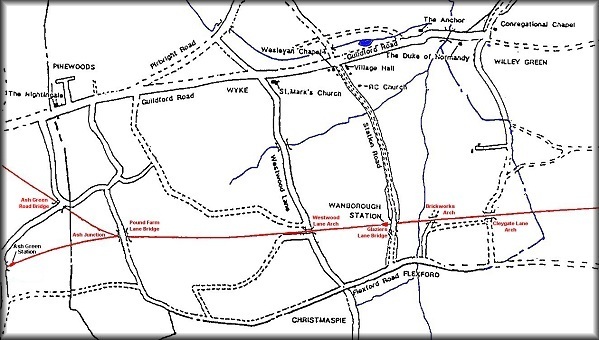 The building of the line entailed the construction of an embankment throughout almost the entire dead straight course through the parish. Lannoy Arthur Coussmaker did rather well out of the deal he struck with the railway company. As well as being compensated for the loss of the land and the disruption the building caused, he arranged to have a siding on the embankment above Westwood Lane to facilitate the carriage of goods and produce to and from the Westwood estate. He also obtained a cattle-creep to connect with the land that had been separated from the rest of the estate. The line also cut off some fields on the north from the Mangles' Christmaspie Farm and Lannoy Arthur was able to purchase these to add to his estate. The construction of the line had other consequences for the area. The route to Guildford via Cleygate Lane necessitated the building of an arch under the embankment, which at this point is so low that in order to provide sufficient clearance the road had to be lowered. It was then prone to flooding and it seems that this route to Guildford declined in importance from then on. Another arch was constructed further to the west but this was never large enough for loaded wagons and when Wanborough Brickworks was established on the north side of the embankment there in 1896, a siding was provided for it. Segmental round arch of 5 courses of brick-on-edge. Width of roadway 21ft 6ins. Segmental round arch of 4 courses of brick-on-edge. Width of roadway 12ft 6ins. The hamlet of Flexford would have been cut off from the rest of Normandy by the railway, but at the time of the construction of the line a bridge was built over the railway in an enclosure, described as "Waste" and forming part of the common at the southern end of Glaziers Lane. This bridge with its approach ramps remained in splendid isolation with no made up road on either side until the station was built in 1891 and the road was made up by the Railway Company. Brick, steel and concrete. Box girder. Width of roadway 17ft 6ins. Clearance of arch 14ft 3ins. The arch is not a skew arch but the coures of the roadway is diverted about 30° to pass through arch. Width of centre arch 30ft. Clearance above tracks 18ft. The line was opened on 8th October 1849. 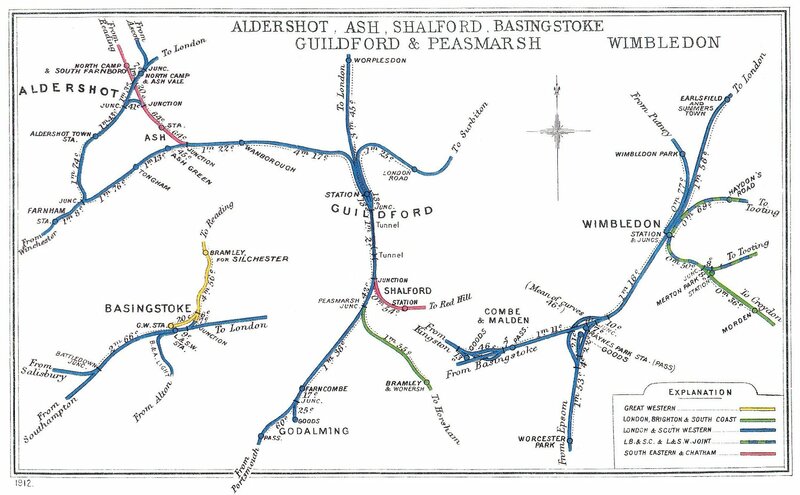 The Reading, Guildford and Reigate Railway Company (RGRR) had obtained running powers over the line as far as Ash Junction from where its own line ran to Reading. An extract from the minutes of a meeting of the Board of Directors of the RGRR, which later became the South Eastern Railway Company (SER), which was held on 11th September at the Royal Exchange Buildings in London reads "Captain Mangles reported that he had seen Mr.Locke who approved of the station (Ash) being made at that point where the Reading-Guildford-Reigate railway leaves the Farnham and Alton branch at a place called Wycke and promises to report his opinions to the authorities of the South Western Railway". Joseph Locke was the Engineer for the London and Southampton Railway, later to become the London and South Western Railway, and was instrumental in getting the initial main line between London and Southampton completed after it had run into grave difficulties. Joseph Locke dismissed the small contractors who had failed to complete the line on schedule and engaged Thomas Brassey who was to become one of the greatest of railway constructors. 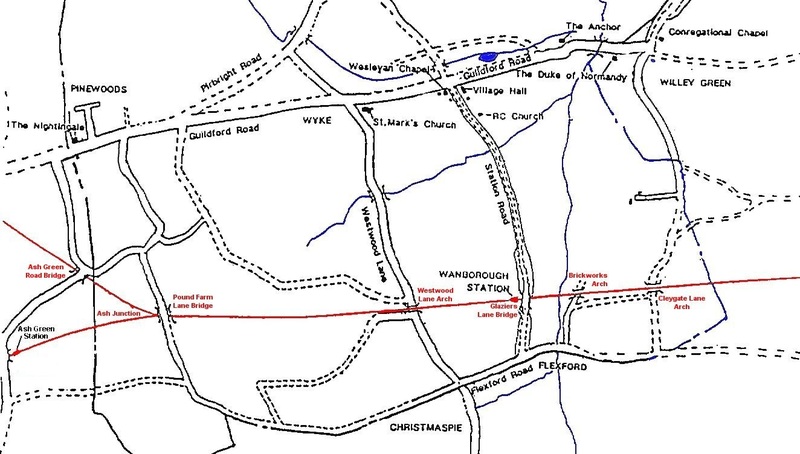 However, the RGRR were annoyed to learn in March 1849 that the LSWR Ash Station would not be at the junction but at Ash Green. This would force them to build their own station at Ash.